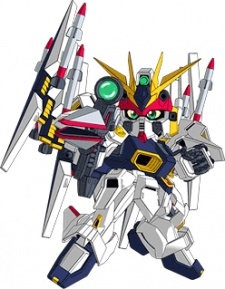 The third Neotopian Gundam to appear, GunEagle is young and cocky. Admiring Captain as a hero, GunEagle is delighted when he can finally fight alongside his idol. GunEagle is specifically created to deal with aerial threats that the other Gundam Force members aren't capable of reaching. While his heart may be in the right place, he often shows off and pays the price soon after. GunEagle is based on the RX-93 Nu Gundam Double Fin Funnel Type from Mobile Suit Gundam: Char's Counterattack.